I'm having the exact same issue. Whenever I have the Engineer's manual open, to any page at all, the game crashes without generating an error log after about 30 seconds. If I remove Immersive Tech it stops crashing. I was updating mods and one needed a new version of forge. Updating to 2577 causes a error and it crashes during loading. I'm not sure what I'm looking for in the crash log so I tested it by removing and replacing mods until it crashed again during loading. List of loaded APIs: * AbyssalCraftAPI (1.11.1) from AbyssalCraft-1.12.2-1.9.4.3.jar * AbyssalCraftAPI|Biome (1.11.1) from AbyssalCraft-1.12.2-1.9.4.3.jar * AbyssalCraftAPI|Block (1.11.1) from AbyssalCraft-1.12.2-1.9.4.3.jar * AbyssalCraftAPI|Condition (1.11.1) from AbyssalCraft-1.12.2-1.9.4.3.jar * AbyssalCraftAPI|Disruption (1.11.1) from AbyssalCraft-1.12.2-1.9.4.3.jar * AbyssalCraftAPI|Energy (1.11.1) from AbyssalCraft-1.12.2-1.9.4.3.jar * AbyssalCraftAPI|Entity (1.11.1) from AbyssalCraft-1.12.2-1.9.4.3.jar * AbyssalCraftAPI|Event (1.11.1) from AbyssalCraft-1.12.2-1.9.4.3.jar * AbyssalCraftAPI|Integration (1.11.1) from AbyssalCraft-1.12.2-1.9.4.3.jar * AbyssalCraftAPI|Internal (1.11.1) from AbyssalCraft-1.12.2-1.9.4.3.jar * AbyssalCraftAPI|Item (1.11.1) from AbyssalCraft-1.12.2-1.9.4.3.jar * AbyssalCraftAPI|Necronomicon (1.11.1) from AbyssalCraft-1.12.2-1.9.4.3.jar * AbyssalCraftAPI|Recipe (1.11.1) from AbyssalCraft-1.12.2-1.9.4.3.jar * AbyssalCraftAPI|Ritual (1.11.1) from AbyssalCraft-1.12.2-1.9.4.3.jar * AbyssalCraftAPI|Spell (1.11.1) from AbyssalCraft-1.12.2-1.9.4.3.jar * ForestryAPI|apiculture (5.0.0) from forestry_1.12.2-5.7.0.231.jar * ForestryAPI|arboriculture (4.3.0) from forestry_1.12.2-5.7.0.231.jar * ForestryAPI|circuits (3.1.0) from forestry_1.12.2-5.7.0.231.jar * ForestryAPI|climate (5.0.0) from forestry_1.12.2-5.7.0.231.jar * ForestryAPI|core (5.7.0) from forestry_1.12.2-5.7.0.231.jar * ForestryAPI|farming (2.2.0) from forestry_1.12.2-5.7.0.231.jar * ForestryAPI|food (1.1.0) from forestry_1.12.2-5.7.0.231.jar * ForestryAPI|fuels (3.0.0) from forestry_1.12.2-5.7.0.231.jar * ForestryAPI|genetics (5.7.0) from forestry_1.12.2-5.7.0.231.jar * ForestryAPI|greenhouse (5.2.0) from forestry_1.12.2-5.7.0.231.jar * ForestryAPI|hives (4.1.0) from forestry_1.12.2-5.7.0.231.jar * ForestryAPI|lepidopterology (1.4.0) from forestry_1.12.2-5.7.0.231.jar * ForestryAPI|mail (3.1.0) from forestry_1.12.2-5.7.0.231.jar * ForestryAPI|modules (5.7.0) from forestry_1.12.2-5.7.0.231.jar * ForestryAPI|multiblock (3.0.0) from forestry_1.12.2-5.7.0.231.jar * ForestryAPI|recipes (5.4.0) from forestry_1.12.2-5.7.0.231.jar * ForestryAPI|storage (5.0.0) from forestry_1.12.2-5.7.0.231.jar * ForestryAPI|world (2.1.0) from forestry_1.12.2-5.7.0.231.jar * gendustryAPI (2.3.0) from gendustry-1.6.5.8-mc1.12.2.jar * Guide-API|API (2.0.0) from Guide-API-1.12-2.1.4-57.jar * ImmersiveEngineering|API (1.0) from ImmersiveEngineering-0.12-76.jar * ImmersiveEngineering|ImmersiveFluxAPI (1.0) from ImmersiveEngineering-0.12-76.jar * jeresources|API (0.8.5.27) from JustEnoughResources-1.12.2-0.8.5.27.jar * journeymap|client-api (1.4) from journeymap-1.12.2-5.5.2.jar * journeymap|client-api-display (1.4) from journeymap-1.12.2-5.5.2.jar * journeymap|client-api-event (1.4) from journeymap-1.12.2-5.5.2.jar * journeymap|client-api-model (1.4) from journeymap-1.12.2-5.5.2.jar * journeymap|client-api-util (1.4) from journeymap-1.12.2-5.5.2.jar * JustEnoughItemsAPI (4.13.0) from jei_1.12.2-4.8.5.138.jar Launched Version: MultiMC5 LWJGL: 2.9.4 OpenGL: GeForce GTX 950/PCIe/SSE2 GL version 4.6.0 NVIDIA 388.71, NVIDIA Corporation GL Caps: Using GL 1.3 multitexturing.Using GL 1.3 texture combiners.Using framebuffer objects because OpenGL 3.0 is supported and separate blending is supported.Shaders are available because OpenGL 2.1 is supported.VBOs are available because OpenGL 1.5 is supported. I seem to be getting this error everytime the mod loads. can you send the crashlog? OpenGL: Intel HD Graphics 3000 OpenGL Engine GL version 2.1 INTEL-10.4.14, Intel Inc.
Hi, I don't know your modpack policy. 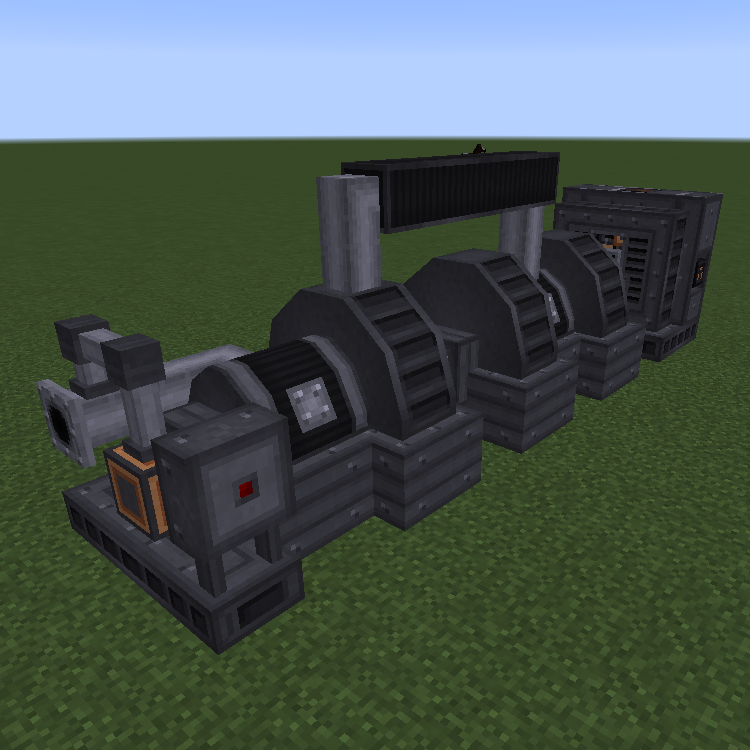 If it's possible, could you add a machine similar to the industrial coke oven from Immersive integration? I miss that thing so much. Hi, i'm having this issue that, when i change position around the steam turbine it just becomes invisible. It isn't destroyed but it just dissapears briefly. Do you know how can i solve this. What happened to the 1.10.2 version? I wanted to make another pack with it in it, but there's no download? Will there be other ways to make steam?